Sparta City Hall is located at 201 West Oak Street, Sparta, WI 54656; phone: 608-269-4340. Photo: William G. and Anne Williams House, ca. 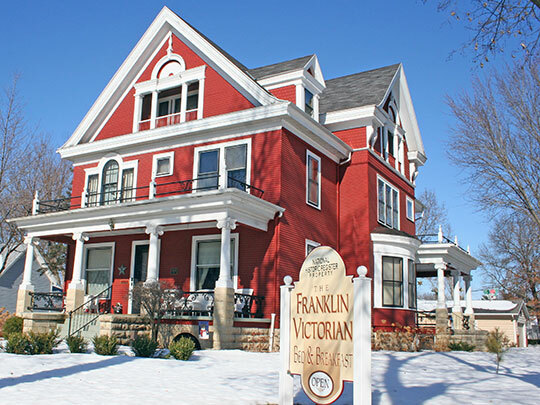 1900, 220 East Franklin Street in Sparta, WI. Listed on the National Register of Historic Places in 2005. Photographed by User:Jonathunder (own work), 2009, [cc-by-3.0 (creativecommons.org/licenses/by/3.0)], via Wikimedia Commons, accessed June, 2015. The City of Sparta was incorporated in 1883. The first European settlement of the area was established in 1849. The settlement was located at the crossroads of the military road between Prairie du Chien and Hudson and the road between Portage and LaCrosse. Many of the early settlers were Welsh migrants from New York who came west to farm. After the Civil War, most of the settlers arriving in the Sparta area were of German and Scandinavian descent. In 1859, artesian mineral waters were discovered in Sparta. The waters were thought to have healing powers and Sparta was promoted as the "Saratoga of the West." (see Saratoga Springs, New York). The Chicago and Northwest Railway, constructed in 1873, brought passengers to the well-known local springs. The railroads were a major factor in the early commercial and industrial development of the area. In the late 1870s there were several large slaughterhouses in the area. Sparta was a major wholesale market for buying and selling pork. Other early industries included a paper mill, stave factory, several glove and mitten manufacturers, an iron foundry and several lumberyards. During the later decades of the 19th century, Sparta prospered as a trade center for the surrounding agricultural region. By 1890, west central Wisconsin was an important dairy area, other agricultural products of the region included a variety of fruits and vegetables, tobacco and grains. Many of the key buildings in Sparta, now considered landmarks, were constructed during the 1890s and early 1900s. The business district on Main Street and North Water Street developed during the prosperous years between 1900 and 1945 when Spartans referred to the community as the "Gem City of Western Wisconsin." Two major institutions have played a dominant role in Sparta's development. In 1885, the Wisconsin State School for Dependent Children was established. This faculty was a major employer in the Sparta area for nearly 90 years, until it was closed in the 1970s. Town and City of Sparta, Wisconsin and Mid-America Planning Services, Inc., Smart Growth Comprehensive Plan — 2023, 2003, www.wi.gov, accessed June, 2015.